Another epic 2-part Star Trek: The Next Generation episode re-edited as a feature-length presentation. 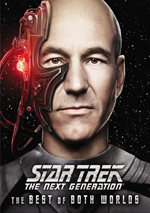 Follow Captain Picard and Lieutenant Worf as they fight to end a Klingon Civil War. Across Seasons Three and Four of Star Trek: The Next Generation, the series delivered its first-ever cliffhanger via The Best of Both Worlds. This double-episode became quite popular and inspired the series’ producers to try again via “Redemption”, a program that spanned Seasons Four and Five. All through Season Four, we got reminders of the dishonor Worf (Michael Dorn) experienced in Season Three’s “Sins of the Father”. Redemption brought that matter to a head. Gowron (Robert O’Reilly) nears the ceremony to make him the leader of the Klingon High Council, but problems related to his deceased competitor Duras remain. That dude’s sisters B’Etor (Gwynyth Walsh) and Lursa (Barbara March) may enact some dastardly doings to prevent Gowron’s ascension. Worf tries to reverse his dishonor and he connects with brother Kurn (Tony Todd), who apparently espouses civil war to recompose the corrupt High Council. Worf opposes this, but he thinks up a method to keep Gowron in power and also clear the family name. In the meantime, backed by an alliance with the Romulans, Duras’ sisters push the appointment of his son Toral (J.D. Cullum). This eventually leads to battles related to the Klingon civil war. All of this comes to a head when Worf must choose between his role as a Starfleet officer and his obligations as a Klingon. While not quite up to the standards of the Borg saga in “The Best of Both Worlds”, “Redemption” nonetheless offers a pretty solid piece of work. It provides intrigue, action, and a few cool twists, including one that took me totally by surprise. I was happy to see additional development of Worf’s tale, though some of the subplots falter. In particular, the second-half moments between Data and Hobson appear heavy-handed, and it makes no sense that Data clearly gets angry with his first officer; I thought Data possessed no capacity to get emotional, but he clearly becomes miffed with Hobson’s insubordinate attitude. The moments between Worf and his Klingon brethren appear intriguing though not as well fleshed-out as I’d like. In addition, a new character provides a convoluted and nonsensical backstory that doesn’t receive adequate coverage here. While the subplots sputter a little, the rest of “Redemption” seems compelling. Mostly it’s a cat and mouse battle scenario, and it provides a taut and intelligent exploration of those moments. Ultimately, “Redemption” delivers a strong two-part episode. Star Trek: The Next Generation appears in an aspect ratio of approximately 1.33:1 on this Blu-ray Disc. Prior HD ST:TNG looked good, and that trend continued here. Actually, “Redemption” provided more challenging material than most due to the photographic conditions in Klingon climes. Those were always dimly-lit and foggy by design, which made them intentionally murky – and tough to replicate. These were always ugly on the old DVDs but they came across much better on the Blu-rays, as the move back to the original 35mm film removed the added murk that came with videotape. That said, “Redemption” tended to look a bit softer than most other HD ST:TNG, but I didn’t think of this as a real problem. Again, the original photography meant a certain dense feel to “Redemption”, but the Blu-ray brought the elements to life about as well as one might hope. Sharpness remained pretty good. The series’ style of photography favored a slightly soft look, but within those parameters, it maintained a good sense of accuracy and clarity. No issues with jaggies or moiré effects materialized, and I saw no edge haloes. With a nice layer of grain, I didn’t witness digital noise reduction, and the show lacked print flaws. Colors tended toward the earthy spectrum typical of TNG, though the Klingon environments favored darker hues, with an emphasis on reds. The Blu-ray handled these tones well and made them effective and clear. Blacks were dark and tight, and low-light shots demonstrated solid delineation. This was a consistently appealing presentation of difficult visual subject matter. I’ve always felt pleased with prior TNG remixes, and the DTS-HD MA 7.1 of “Redemption” worked well. The soundscape favored action enough to give it a solid sense of life and environment. Much of the material focused on general ambience, but the track kicked into higher gear when necessary, and that left us with some exciting action sequences. Those delivered well-placed material that moved around the spectrum in a smooth, vivid manner. At all times, audio quality seemed solid. Speech was concise and crisp, without edginess or other issues, and music appeared bright and full. Effects showed good clarity and accuracy, with deep lows that added a strong blast at the right times. This was another satisfying remix. The disc throws in a few extras. New to the Blu-ray, we get an audio commentary from writer Ronald B. Moore and scenic artists/Trek historians Mike and Denise Okuda. All three sit together for this running, screen-specific look at the episode’s origins and development, opposition to the “serial” nature of a two-part program, story/character areas, cast and performances, effects and production design, sets, costumes and effects, and some memories of the production. All three participants are commentary veterans, and they seem comfortable with the format. They combine to give us a fun overview of the double episode, especially when Moore digs into the issues that affected the story. The track sags a little as it progresses, but it still offers a lot of useful material. A new featurette called Survive and Succeed: An Empire At War lasts 30 minutes, six seconds and includes notes from Moore, ST:TNG Companion author Larry Nemecek, visual effects supervisor Dan Curry, stunt coordinator Dennis Madalone, composer Ron Jones, and actors Robert O’Reilly, Michael Dorn, Gwynyth Walsh, and Denise Crosby. “Empire” covers the story’s origins and path to the screen, story/character notions, Worf’s growth and arc, cast and performances, makeup design, weapons and stunts, music, and a few other areas. “Empire” offers a nice overview of “Redemption”. Moore repeats some of the notes from the commentary, but the other participants deliver a good array of new observations. The show moves well and gives us a fun, informative take on the episode. 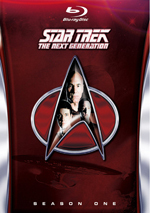 The disc opens with ads for Next Generation Seasons Three and Four, Enterprise Season Two and The Best of Both Worlds. We also find episodic promos for both parts of “Redemption”. Though not quite as entertaining as prior two-part episode “The Best of Both Worlds”, I think “Redemption” provides a quality experience. It mixes action and drama in a satisfying way; while it never becomes as “cinematic” as its predecessor, it still works well. The Blu-ray delivers very good picture and audio along with a couple of interesting bonus materials. As was the case with “The Best of Both Worlds”, it can be tough to recommend this “Redemption” Blu-ray – at least to die-hard fans. 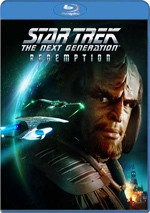 If you already plan to buy Seasons Four and Five of TNG, you don’t get great value from the “Redemption” Blu-ray. It lets you see the two episodes edited into one “movie” and adds a couple of extras, but that doesn’t seem like a lot for your $25 MSRP. It’s a nice standalone product if you don’t intend to purchase TNG Seasons Four and Five, but if you get those, this disc probably isn’t worth the money.